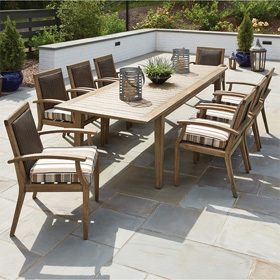 This complete outdoor dining set from Telescope Casual offers high-quality design and comfort, plus low-maintenance upkeep. The arrangement seats four individuals and is available with your choice of stationary dining chairs or motion-based based swivel rocker chairs. All seating options have high backs that provide additional lumbar support, quick-drying sling fabrics, and transitional-look frames that will complement both modern and classic patios. The set is completed by an aluminum slat top table that matches a clean aesthetic with superior functionality. Lifestyle Image: Sling fabric shown in Walnut (810) with Kona frame finish. Dining Chair 27"W x 29"D x 44"H 22lbs. Swivel Rocker 27.5"W x 28"D x 44.5"H 31 lbs. Table 56"L x 56"W x 29"H 75 lbs.